Amazon’s plans to use aerial drones to deliver packages are advancing. The e-commerce titan this week was granted a patent for a delivery drone capable of detecting verbal or physical gestures from humans and responding accordingly. An illustration accompanying the patent, originally filed in July 2016 but marked as a continuation of an application first submitted in 2014, shows a man waving his arms as a drone seemingly approaches a home. The drawing is accompanied by a blank speech bubble, suggesting the man is barking commands at the drone overhead. The patent was first spotted by GeekWire. In its description, Amazon mentions that a human could wave their arms in a “shooing” manner which would tell the drone that it should not proceed along its current path. A person waving their arms in an “inviting” manner, however, could be interpreted as an instruction to land and deliver the payload. DJI and Samsung have also developed human-detecting drone products. Amazon says the UAV could be laden with sensors. Examples listed include a depth sensor, a visible light camera, infrared camera and ultraviolet sensitive cameras for input and things like speakers, microphones and laser projectors for outbound communications. As always, keep in mind that this is just a patent and comes with no guarantee that Amazon will ever implement the technology in a consumer or commercial product. It’s also just one of many patents that Amazon has filed for in recent memory. 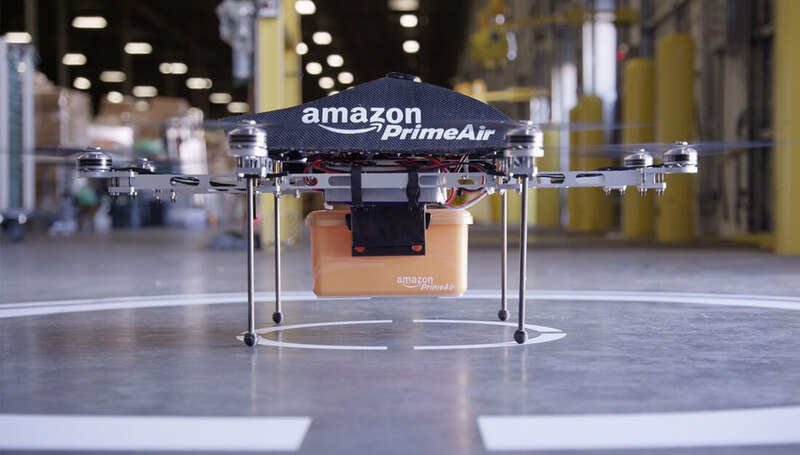 Drone delivery is an area of intense interest for Amazon. The concept was first announced publicly by CEO Jeff Bezos in 2013 but has yet to take flight in an official capacity due to technological hurdles and an uncertain regulatory environment.